Have you ever wondered what it's like to use fabric or 'real' nappies? I've been using them for over 5 years now (how scary is that, I never understand how time goes so quickly.) When I was pregnant with my first child (and totally clueless about looking after young children and babies) I wanted to use them to do my bit for the environment and also because they're much cheaper in the long run (especially if you reuse them for 4 children.) They say that if Queen Elizabeth I had been in disposable nappies, they would still be decomposing now. What a lovely thought. 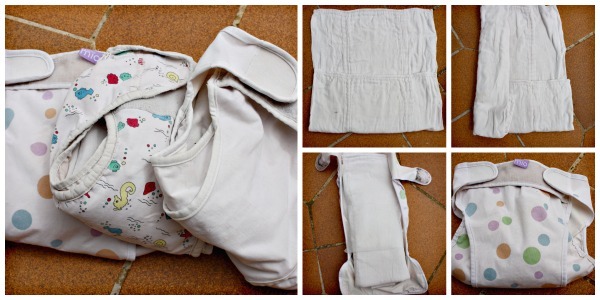 How do you start using fabric nappies? I found someone who sold nappies in the area and she said she'd come round and show them all to me. At the time I wondered how complicated could it be. I just wanted a nappy. She arrived with basketfuls of different nappies. By the end of the evening my weary brain was muddling 'pre-folds' and 'pockets', 'wraps' and 'inners'. Clearly I was a nappy newbie. What is a 'pre-fold' nappy? What is a 'pocket nappy'? Other nappy options include the 'pocket nappy'. The nappy consists of a plastic outer and a fleecy inner with a 'pocket' in-between. You put a fabric liner into the pocket. Normally this option is more expensive at the outset, but often the nappy has poppers so that you can make it bigger or smaller. This type of nappy is often really cute with beautiful soft outers and lovely patterns. 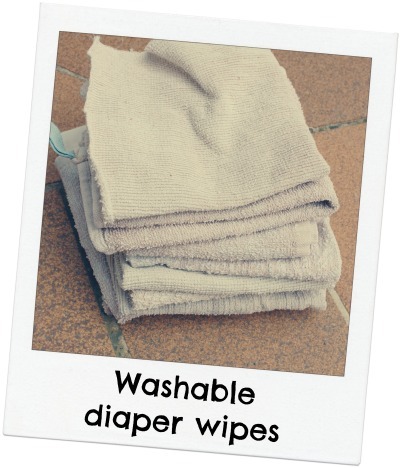 However, you do have to wash the whole nappy every time and they're much more bulky than the pre-fold system. I have several, including the brand 'blueberry' who do fantastic patterns, cow prints, leopard prints, pink and fluffy, that kind of thing. To use a paper liner or not with a pocket nappy is another question. Some people do, some don't. 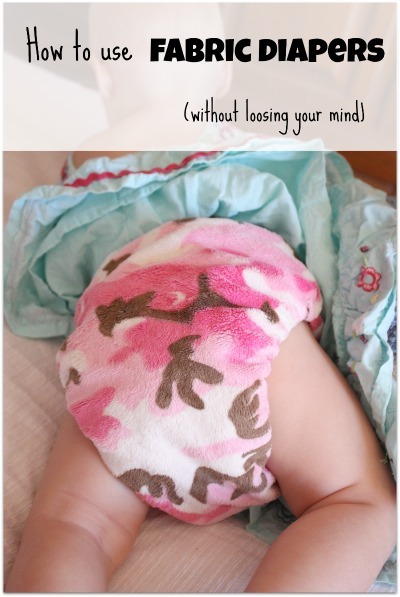 What is a 'wrap around' fabric diaper? The final option that I've personally tried is what I call a 'wrap around' nappy. It's a bit like the pre-fold but instead of just a bit of fabric, you have a whole fabric nappy that goes all the way around the baby's waist. Then you put a plastic outer wrap on in the same way. I've tried 'little lambs' who are a good company but I found them too bulky for me. Personally, I prefer the pre-folds but it's just personal preference. You can get the fabric bit in a range of fabrics that have different advantages, cotton, bamboo, fleece. Things to consider are drying time, absorbency and comfort. Is using fabric nappies really difficult? Do they leak? So, that's the nappies, but how about using them? Well, I bought a whole load before Galen was born as I thought that if I got used to disposables I would never make the switch. Actually it was fine. We had a bit of a dodgy moment right at the beginning when they seemed to be leaking every time. Luckily our nappy lady was fantastic and whizzed round to help us (even though she lived an hour away). He was quite little at the time but I wasn't making sure the nappy was snug around his legs so all the liquid was leaking out. The other things she pointed out was to make sure the paper liner wasn't sticking out at all. After the initial leaking problems, I didn't have any more problems. Even when my disposable using friends were complaining of explosive poo going everywhere, we were fine. At least until I opened the nappy, then the fun began. Do I do a lot of washing? I wash everything in cold water. I chuck everything in together, whites, colours, nappies. I'm sure that clothes don't come out 'sterile' but it's not as if I'm going to eat off them and they look and smell clean so that's good enough for me. I've never used a tumble drier (at times the house looks like a chinese laundry). In fact tumble drying is supposed to reduce the absorbency of the nappy. Can you use fabric nappies at night time? I have to confess that now I use a disposable nappy at night time. My first son was in just fabric nappies for over a year. But when he got bigger, they started leaking at night time. I tried adding extra absorbers but that just gave him sores. In the end I gave up and resorted to disposables. And then I got lazy with the others. Also, they do smell a bit if you leave them on all night. 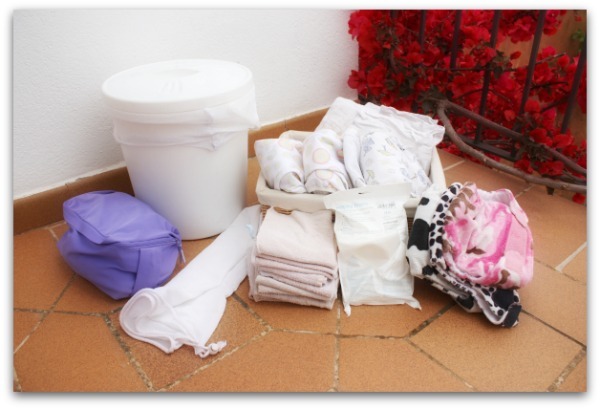 What other equipment do you need if you want to use reusable diapers? I have heard it said that on general kids in fabric nappies can be potty trained earlier as they're more used to feeling wet nappies. I'm not sure if that's true or not. If it is, perhaps it's that their parents are really keen to stop having to wash nappies all the time. So, if you're thinking about trying them, I'd urge you to give it a go. The problem is the outset of money right at the beginning. It's not as if you can return a used nappy. Some councils offer vouchers so it's worth checking them out. Some towns have laundry services where you pay to get them washed, generally they provide the nappies for you. Perhaps you know people who can lend them to you to try. Or perhaps you can just take the plunge and give it a go.